Eventbase powers the best festival apps for the world's premiere festivals including South By SouthWest (SXSW), Sundance Film Festival, and Comic-Con International. Let us elevate your fan experience with a memorable mobile experience. Your attendees deserve a beautiful, visually-engaging festival app that is far from boring. Our team will work with you to create a stunning event app that is tailored to your brand with custom fonts, graphics and animations. We will make your brand look great and deliver an exceptional user experience that attendees – and your team – will love. 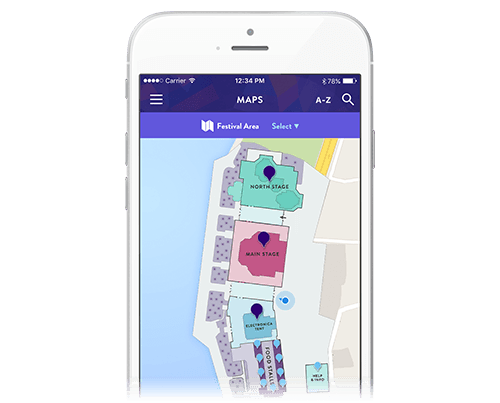 Eventbase offers feature-rich, interactive maps that work offline and can even be updated after the app is approved. Our stylized Overlay Maps, which sit on top of Apple or Google Maps, can include custom pins and pin filters for users to show or hide certain types of locations. We can also include different levels of map detail at various zoom levels, with finer detail when zoomed in. Offer your sponsors a range of highly visible activation options in your premium festival app. Best of all, your team can update key graphics such as interstitials and rotating banners throughout your app anytime. Optional location-based activations are also available, which are perfect for drawing attention to on-site sponsor booths or activations. For smaller, Essential events throughout the year, you can use Eventbase Manager to easily create and publish events with agenda details, networking features, floor plans, maps and more.